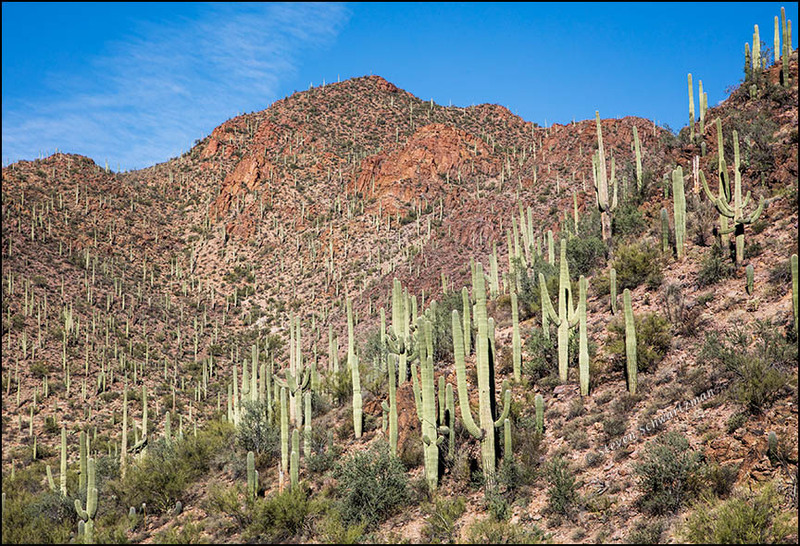 In today’s picture it’s not the saguaro cacti (Carnegiea gigantea) themselves that slant, but the land on which they grow in Tucson Mountain Park. 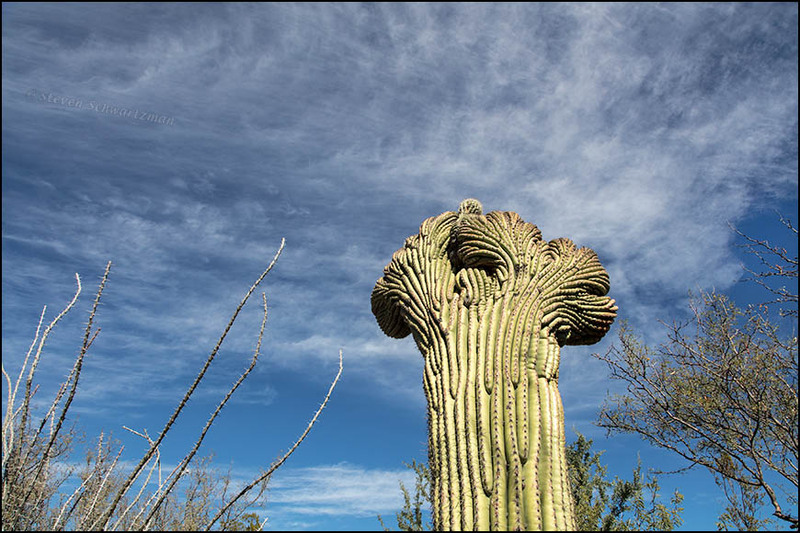 After yesterday’s close-up of a giant saguaro, I felt you should have an overview showing a dense colony of these giant plants. Back on November 7th I thought this was a good way to begin my photo-taking day. If you’re interested in the craft of photography, you’ll find that point 18 in About My Techniques applies to this image. The subjects of two recent successive posts—one from California and one from Texas—were epiphytes, organisms that grow on animate or inanimate objects for physical support but not for sustenance. Once in a while the seed of a plant that normally grows in the ground manages to take hold on something above the ground and survive, thus becoming an epiphyte. That was the case with the prickly pear cactus (Opuntia spp.) 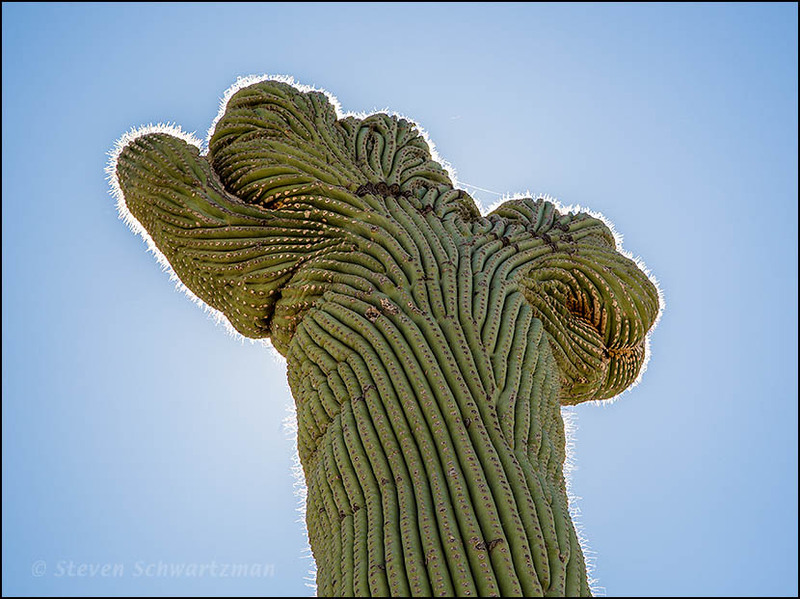 that I saw on November 8th in the cleft of a giant saguaro (Carnegiea gigantea) in the eastern section of Saguaro National Park in Tucson, Arizona. Given the huge size difference between the two types of cacti, you can’t see the prickly pear well in the photograph above, but you’re welcome to click the excerpt below to zoom in for a closer look. * In spite of my hope that the phrase “opportunistically epiphytic” would be unique, an Internet search turned up one other example. In a post last October that showed a fasciated spectacle pod plant in Albuquerque, I mentioned that it was one of four such specimens I saw on my Southwest trip. I promised you’d see more, so here’s one of two fasciated saguaros (Carnegiea gigantea) that I saw in Arizona. The photograph is from October 3, 2014, in the Rincon Mountain District of Saguaro National Park on the east side of Tucson. 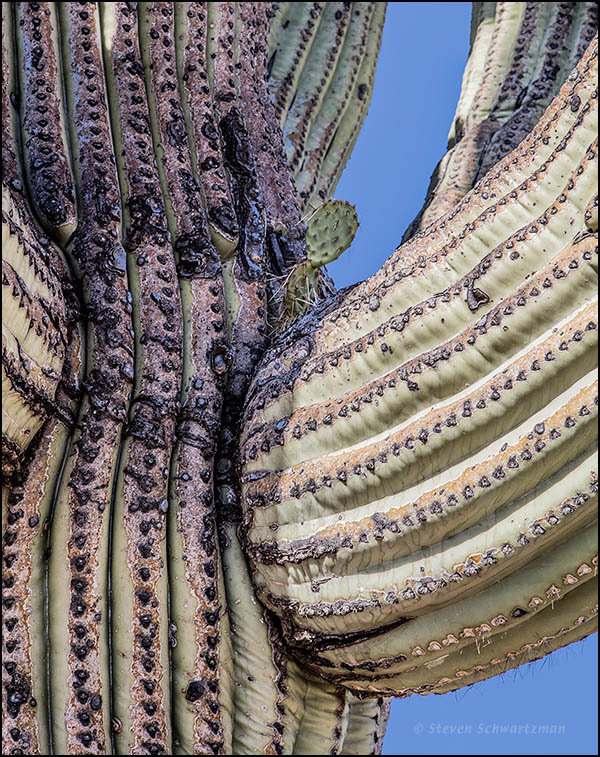 If you’re new to fasciation, also known as cristation, or if you’d like a refresher, you can read an introductory article that coincidentally includes a picture from Saguaro National Park, although it’s the part of the park on the other side of Tucson from the one that provided today’s photograph. 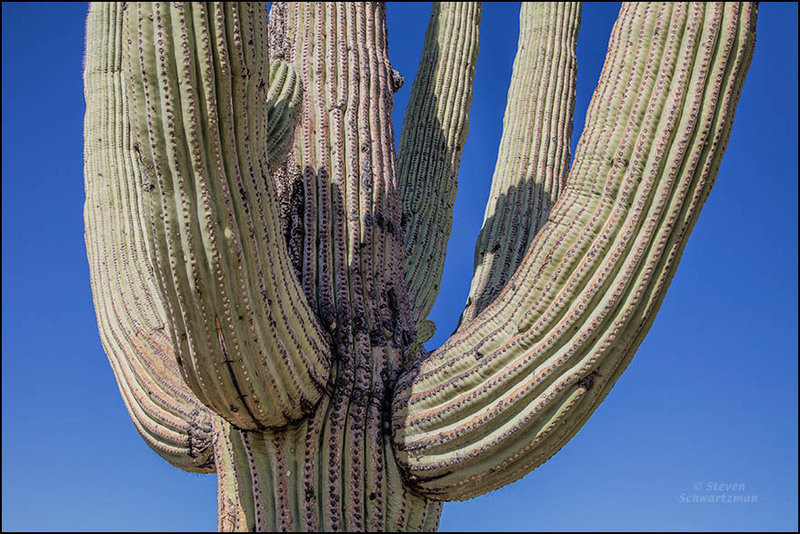 This gigantic fasciation marks the conclusion of the saguaro miniseries that’s been fascinating you for several days.